Jihane Chedouki hold a PhD in Private Law from the University of Poitiers. She also graduated in Public Law and Political Science respectively from Faculty of Law of Tangier (Morocco) and Panthéon-Assas University in Paris. Her doctorate focused on the protection of cultural heritage in the Arab States. Previously, she realized many researches as a postdoctoral fellow and a consultant in the field of cultural heritage law on behalf of public and international institutions such as Centre National de la Recherche Scientifique, European Union and UNESCO. Currently, she is working as a Protection Delegate for the International Committee of the Red Cross in Iraq. Asya Darbinyan is a PhD Candidate at the Strassler Center for Holocaust and Genocide Studies, Clark University. Her dissertation explores the Russian Empire’s response to the Armenian Genocide and to the refugee crisis at the Caucasus front of the Great War. Previously, Darbinyan worked at the Armenian Genocide Museum-Institute, Yerevan, as a senior research fellow and the Deputy Director of the museum (2008- 2013). She was awarded multiple scholarships and grants to travel and work at archives in Tbilisi (2017), in Moscow (2016), and in Yerevan (2014, 2015). Darbinyan has presented at a number of international academic conferences and has published scholarly articles in Armenian and in English. Sam De Schutter studied history (BA and MA) at Ghent University, Belgium, where he graduated with a thesis on Congolese study migration to Belgium since independence. He also obtained an MA in social and cultural anthropology at Leuven University, Belgium, with a thesis on migration imaginaries in the city of Kinshasa, Congo. Currently, he is a PhD student at Leiden University within the ERC funded project “Rethinking Disability”. His research focuses on how knowledge and ideas about disability circulated within practices of international development by UN specialized agencies in Africa. Nicole Dressler is a Ph.D. candidate in Northern Illinois University’s History Department specializing in early America, with research interests in the history of humanitarianism and labor. Her dissertation explores the role that British convict transportation and penal servitude in America played in the early history of humanitarianism, arguing that emerging ideas of punishment, morality, and unfreedom evoked by convict labor created new moral responsibilities and inspired denunciations of suffering in the eighteenth- and early nineteenth-century Anglo-American world. She is a recipient of dissertation fellowships from the Library Company of Philadelphia (2016-2017) and the McNeil Center of Early American Studies (2017-2018). Sarah Frank is a social historian of the French Empire and the Second World War, with a specific focus on captivity. She received her PhD (History) from Trinity College, Dublin in 2015. She also holds an M.Phil in Modern Irish History also from Trinity College, Dublin and a B.A. in French and History from Hamilton College, Clinton, NY. The Irish Research Council funded her doctoral research entitled ‘Colonial prisoners of war and Vichy France, 1940-1942: experiences and politics’. David Grealy is a 1st year PhD student studying history at the University of Liverpool. Born in Lancaster, England, he enrolled as an undergraduate at the University of Liverpool in 2011. After graduating with a BA (Hons) in history, he decided to continue my studies in Liverpool by undertaking an MA in twentieth-century history. Although the merger of intellectual and diplomatic history has intrigued him for many years, the study of human rights, and the influence exerted by the concept in a diplomatic setting, emerged as my particular area of interest during his Master’s degree. Felix A. Jiménez Botta was born in Cuba in 1987, and grew up in both Germany and the United States. He graduated with a Bachelor of Arts in 2011 from Florida State University in History and International Affairs. Enrolled that same year in a PhD program in History at Boston College with Prof. Devin Pendas as his advisor. For the year 2015-2016, he was a DAAD fellow under tutelage of Stefan Rinke at the FU Berlin. He plans to defend his dissertation in the Spring Semester 2018. Natalie Klein-Kelly holds an M.Phil in European Studies (1995) from Cambridge University, UK, and a PhD in Modern History (1998) from Mainz University, Germany, as well as an MSc in Development Management (2015) from the Open University, UK. After working a number of years for McKinsey & Company in Frankfurt, Germany, and Seoul, Korea, she joined the International Committee of the Red Cross (ICRC) in 2003, working in the Protection field in Sri Lanka, Indonesia, Tunisia, Geneva, Zimbabwe and – most recently – Ethiopia. Currently on a short break, she will take up the position of Protection Coordinator in the ICRC delegation for Israel and the Occupied Territories in September 2017. Kaete O’Connell is a PhD candidate in American history at Temple University specializing in 20th century US foreign relations. She earned her BA from Drew University (2008), and her MA in history from Rutgers University (2011). Her dissertation explores the diplomatic and cultural impact of US food relief in occupied Germany. Kaete was previously a guest lecturer at the University of Tübingen, and has an article forthcoming in a special issue of Food and Foodways. She has received fellowship support from Temple’s Center for the Study of Force and Diplomacy and the German Historical Institute. Sharon Park received her PhD in history at the University of Minnesota in 2016. Her dissertation analyzed the intersections of refugee and welfare policies in the United States during the Cold War. She is currently a postdoctoral fellow at the Vienna Wiesenthal Institute for Holocaust Studies. Jean-Michel Turcotte is PhD candidate at Université Laval, Québec and Ruhr-Universität, Bochum (RUB). He is presently doctoral fellow at RUB. His thesis explores the captivity of Germans prisoners of war (POW) during the Second World War. Specifically, he is interested in German POWs in Canada, the United States and Britain. He proposes a new interpretation of the war captivity by focusing on the complex relationship between the policies of the three western Allies as well as the relations between state and non-state actors. He was also doctoral fellow at the German Historical Institute at Washington, D.C., during the summer 2015. 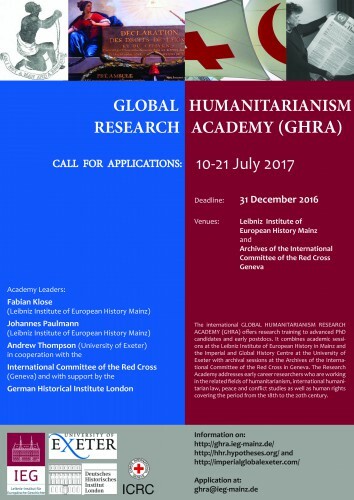 We are very much looking forward to the GHRA 2017! Previous Protectionism 100 years ago helped ignite a world war. Could it happen again?